Another huge office complex is about to rise on the shore of Tempe Town Lake, making sailing this tiny lake just that much more challenging. Hope for an east or west wind whistling down the canyon of buildings. It’s called The Watermark Tempe, a 600,000 square foot office complex that will go up on the north shore, east of the marina and nestling up against Rural Road. It faces the massive State Farm office complex on the south shore, which has disturbed the already-disturbing wind currents on the lake. George Sheller has forwarded this PDF of the complex so you can see where this monster will go. 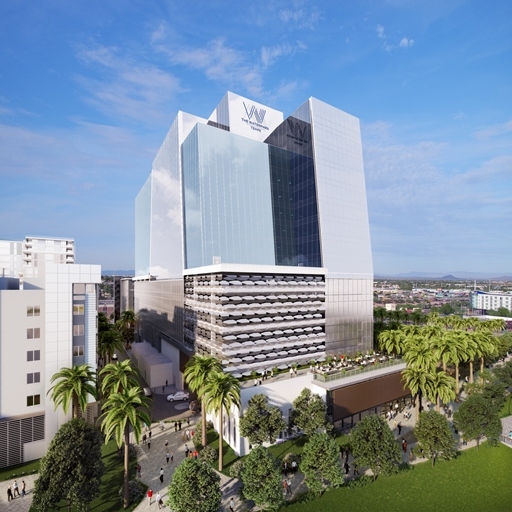 An artist’s conception of the massive new The Watermark Tempe office complex.